Glass showers give any bathroom a spacious, elegant look and feel. The right shower door can compliment your décor and provide a special flair to one of the most popular rooms in the house. Whether you’re constructing a new bathroom or remodeling an existing bath or shower, Glass Castle has the products and expertise you need to create the shower or tub enclosure that works best for your space. From elegant designer look frameless shower doors to traditional tub enclosures our products will enhance the beauty of your bathroom and create a unique statement. Imperial Series. Treat yourself like royalty with a shower from the Imperial Series. The simplicity, tranquility, elegance and sophistication of the frameless design provides a contemporary style and makes an instant statement for your bathroom. Semi-Frameless. Ready to try something new but not quite ready to go frameless? Our semi-framelessshower enclosures give you both style and practicality. Sliding Enclosures. You can’t go wrong with traditional sliding enclosures. Enclosures provide easy access to your shower while protecting the rest of your bathroom from water damage. If you like to keep things simple, this design may work best for your needs. The location of the supporting studs and the type of material your walls are made of to determine the correct glass weight that your bathroom is designed to support. Proper placement of your shower heads so they don’t spray water out of the bath or shower area even when the shower doors are open. Exact measurements of your bathroom space to ensure proper fit and installation. Evaluate the ventilation in your bath or shower area in order to help eliminate problems from excessive moisture build-up. With over the last 3 decades of shower enclosure experience and over 25,000 shower door installations, you can be assured that your installation will go smoothly and professionally. Our technicians value your home and treat it with the respect it deserves. We’ll walk you through the creation, set up and care of your new bath or shower area. Your satisfaction is our top priority, so we provide the options you need to customize your renovation and get the result you want. We install these beautiful glass shower doors throughout Central New Jersey including West Windsor and the Princeton area, as well as Eastern Pennsylvania. 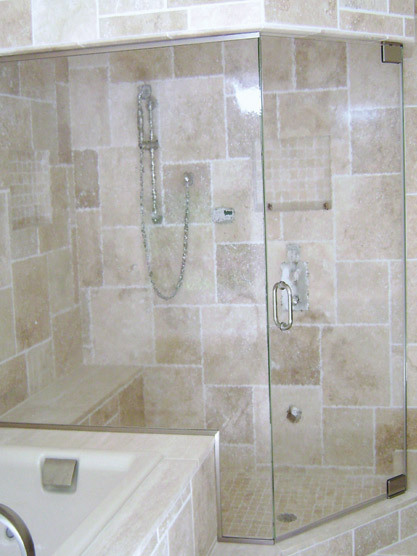 Stop waiting for your dream shower contact us today, and start designing with us.